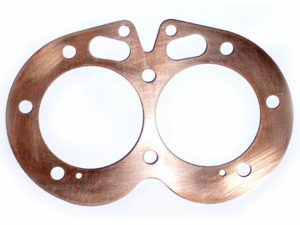 Copper cylinder head and base gaskets in various thicknesses are now available to adjust compression. 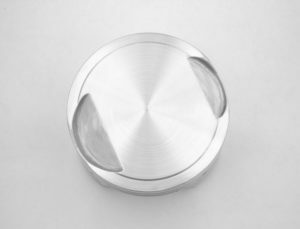 Standard thickness is approx .040″. 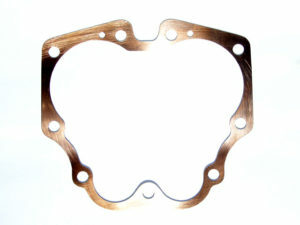 Adding .040″ to a head or base gasket will lower the CR approx one point. Going to a thinner .020″ head gasket will raise it 1/2 point etc. Crushable thin .005″ copper wire is provided for looping around the pushrod tunnels to prevent leaks. Note that Hi compression pistons generally require racing fuels. If you want to use high compression pistons on a street bike then you must use a thicker head or base gasket to reduce the compression to avoid detonation (“pinging”) or risk failure. 9:1 compression is average for carefree street riding. Never use a paper base gasket because they can loosen and cause damage. Instead – use Permatex Motoseal #29132 or “the right stuff” by permatex (for copper base gasket only). Use pliobond 20 or 25 on both sides of the head gasket, the head and cylinders – it must bond to each surface (sealant comparison). (head gasket installation with pliobond video). Special high compression .003″ thick head gasket rings work great (glue down with pliobond 20 or 25 contact cement). Thin copper wire is glued down around the pushrod tunnels and oil return hole to eliminate oil leaks, The wire and glue flattens out perfectly when the head is tightened down. This is the easiest way to raise your compression approximately one point (10%). For example – you can start with our 10:1 C.R. 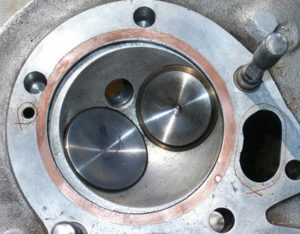 pistons and raise them to 11:1 for racing by using the thin head gasket rings and cutting the tops of the pistons to clear the squish band as in the photo below (see diagram).